Price: $49999 Free shipping Today! The empty space inside your office should be filled by the Lexmark MB2442adwe Multifunction Laser Printer which adds to your work�s smooth functioning. The MB2442adwe Multifunction Laser Printer from Lexmark saves you from the need to buy several machines to do different tasks for it has the ability to print, copy, scan, and fax. It is built with a Dual-Core 1000MHz Processor and a 1024MB memory which gets you going despite being bombarded with loads of printing request. With a print resolution of 1200x1200 DPI, it prints all of your digital documents with clarity and precision which makes sure all text, images, colors, and other details appear accurately on the printout. In addition to this, the Lexmark MB2442adwe comes with a print speed of 42ppm which can produce up to 100,000 pages per month with a first page output time of as fast as 6.25 seconds. It also comes with a user-friendly design and a 4.3� color touchscreen which makes it easy for you to control your printer and smoothly navigate through menus. With the Ethernet connectivity, you can connect the printer to the wired network for additional enhancement while the USB 2.0 enables you to connect to the USB port to print documents. 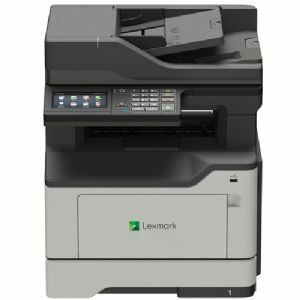 Purchase the Lexmark MB2442adwe Multifunction Laser Printer today!